Used Steel Model Bow Tug For Sale. NEW REDUCED PRICE!! Ex Army S.T. tug in excellent condition throughout and ready to go. Just passed U.S.C.G Subchapter M Phase 1 program. Has sticker in place. Emd 12-567 A block engine with Falk 2.5-1 gear. No spare prop nor shaft. Tug just drydocked November 2012 with plates replaced where needed. Bottom overall in good condition. No less than quarter inch plate now on bottom with more in places. Original thickness was five sixteen plate. This tug is a classic tug in excellent condition. 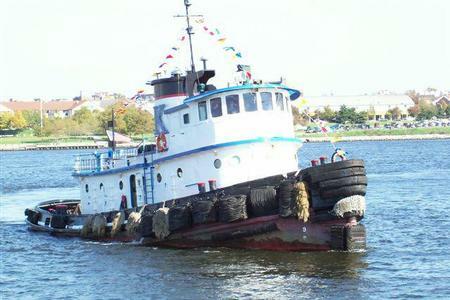 Make good small tug for river work being 85 feet in length and draft can be 8 feet light with 10 feet maximum loaded. LENGTH: 85 FT. / 25.93 MT. BEAM: 23 FT. / 7.02 MT. DRAFT: 8 FT. / 2.59 MT. 78 FT. / 23.8 MT. MAIN ENGINES: 1 Emd 12-567 A HRS.